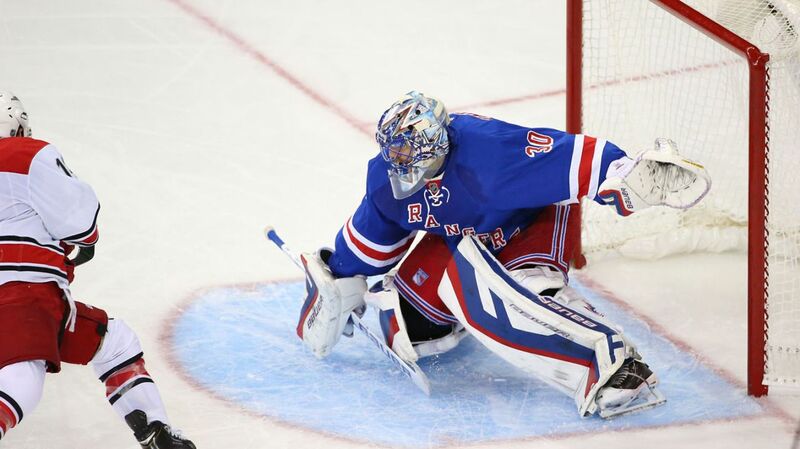 Henrik Lundqvist will make his fifth consecutive start tonight ans the Rangers face off against the rival Devils. After ending a four game home stand with two consecutive wins, including a shutout victory over the Sharks, the Rangers will head to the Prudential Center to take on bitter rivals, the New Jersey Devils. After losing two straight games at home by a score of 6-3, the Rangers have won their last two games, allowing only one goal in the last 125 minutes they have played. Henrik Lundqvist has also rebounded nicely. Lundqvist stopped 62 of the last 63 shots he faced in victories over Carolina and San Jose, as well as stopping all three shots against Carolina. Henrik will be in net tonight, his fifth consecutive start. The Devils have lost their last two games, losing to the Capitals in Washington D.C. 6-2, and losing to the Sharks in their home opener 4-2. They had won their first three games of the season, all on the road, before losing two straight. This is the first season where Martin Brodeur is not the number one goalie for the Devils. That position now belongs to Cory Schneider, who is starting his sixth consecutive game in goal. Schneider has allowed 3 or more goals in three of his five starts, including the Capitals game, where he was pulled after allowing 5 goals in the loss. Most people still believe that Schneider has what it takes to be a starting goalie, despite never playing more than 45 games in a season, which came during last year where he also posted a 1.97 GAA. For the first time this season, New York will have the same lineup for the second straight game. 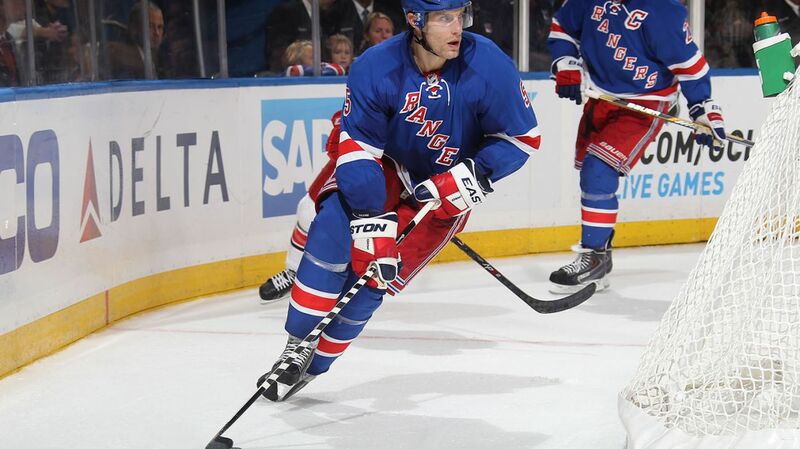 In win over San Jose, Dan Girardi and Kevin Klein both left the ice and required stitches. 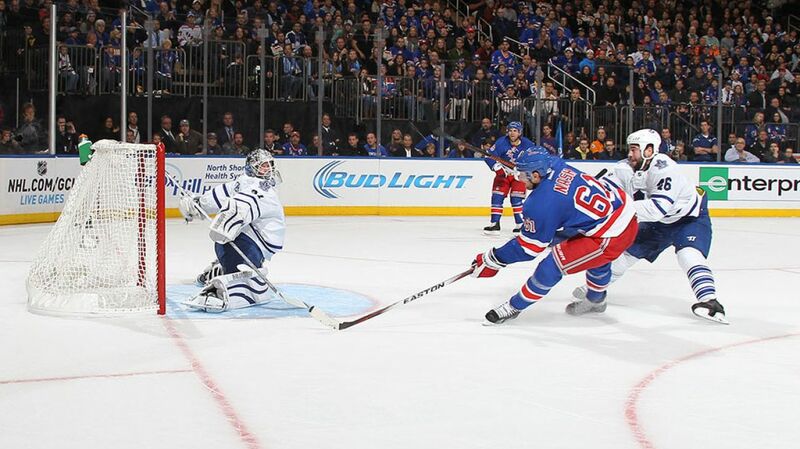 Dan Girardi missed most of the third period after blocking a shot on the lower leg. Kevin Klein took a puck to the chin late in the game. Dan GIrardi will start tonight after receiving stitches in his lower leg following a blocked shot in the third period on Sunday. Klein practiced yesterday, as well as participating in the morning skate. Girardi did not practice yesterday, because the cut was bleeding, but did skate this morning, and will be on the ice tonight. The Rangers will skate with the same forward lines, most notable the big top line that worked so well on Sunday, consisting of Chris Kreider, Kevin Hayes, and Rick Nash. Nash scored his league leading 7th goal on Sunday, and has scored in every game, including the shootout winner over the Hurricanes. Kevin Hayes has impressed the coaching staff, and responded to his big role against the Sharks with his first career goal. This line was one of the Rangers’ most effective lines, and they will stay together. Rick Nash has been on fire, and will look to add to his league-leading 7 goals tonight in Newark. The same forward lines also means that Anthony Duclair will be a healthy scratch tonight. After posting 3 assists in 5 games, Duclair is a scratch for the second consecutive game. The youngster has taken it well, referring to it as a learning process and understanding his role. It still is not clear whether he will remain with the club, but it is looking more and more like he will be sent back to Juniors. 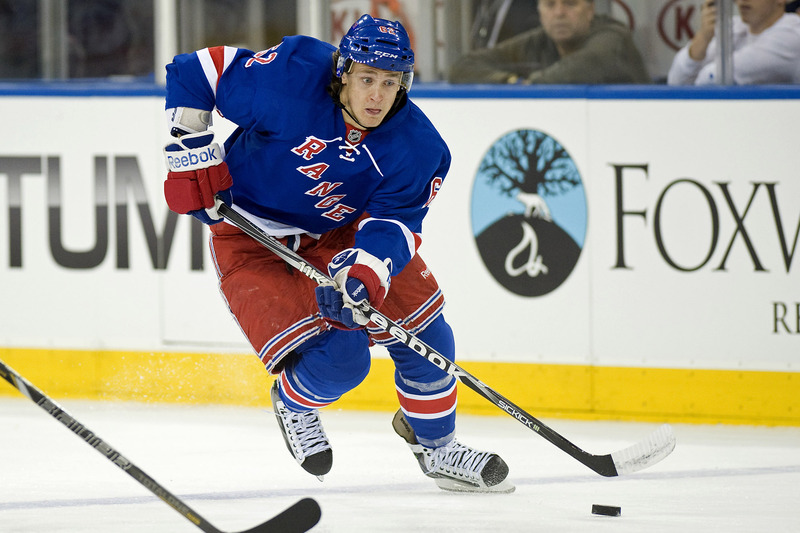 Carl Hagelin, Martin St. Louis, and Kevin Hayes all scored their first goal of the season against the Sharks. Now that they are all have the monkey off of their back, hopefully they will be able to skate comfortably and without that nagging thought of getting the first goal or point in the back of their heads. Carl Hagelin might be affected the most. After not registering a point and posting a minus-five rating in the first game, Hagelin scored a great second effort goal against the Sharks, which also wound up being the game winner. This was a good sign because Hagelin had seemed out of sorts in the first five games, after a strong training camp and preseason, as well as playing great in the playoff run with New York last season. After scoring Sunday, Carl Hagelin will hope to add on to his solid performance and continue to trend his play upwards from here. Mike Cammalleri, an offseason acquisition for New Jersey, has already posted 5 goals and a total of 7 points, and has been one of their better forwards this season. New York is yet to score a power play goal this season, going 0-16, but they may have their best chance of the year against New Jersey, who has let up six power play goals in their first five games, including at least one allowed in four of their five games. Posted on October 21, 2014, in Game Previews and tagged Anthony Duclair, Carl Hagelin, Chris Kreider, Chris Mueller, Dan Girardi, Derick Brassard, Henrik Lundqvist, Kevin Hayes, King Henrik, Madison Square Garden, Marc Staal, Martin St. Louis, Mats Zuccarello, Matt Hunwick, Michael Kostka, MSG, New Jersey Devils, New York Rangers, NHL, NHL 2014-2015 Season, NY Rangers, NYR, Rangers Nation, Rangers Season Opener, Rangerstown, Rick Nash, Ryan Malone, Ryan McDonagh, The Duke, The Ranger Zone. Bookmark the permalink. Leave a comment.